Happy new year everyone! Also happy November and December, seeing as it's been awhile since my last post. The reason for that...well, I'm going to blame our Netflix subscription. I've become super well acquainted with Emily and Daniel from Revenge, Jess and Nick from New Girl, Mindy and Danny from The Mindy Project, and seriously, why didn't anyone tell me how awesome Grey's Anatomy is like ten years ago? I'm now hopelessly addicted to it, and have a long haul of ten 27-episode seasons (quick math: 10 x 27 = 270 episodes) to catch up on, and apparently I've given myself a deadline of about four weeks to do this at the rate I have been going at. No one tell me, but are McDreamy and Meredith going to stay together forever? Because I seriously can't handle it if they don't. And no one tell me, but what's going to happen with Addison and McSteamy, and with Izzie and Alex? They can't get back together, can they? So many questions, so little time for anything but getting all of the answers! 1) Christmas holidays! In my family this is synonymous with food and booze. It's January 3 and I now weigh the most I ever have in my entire life, which is not awesome because my clothes are way tighter than desired. How does this always happen?! Argh - why do I love food so much?! I need a quick fix, which is why I am kickstarting my weight loss regime with a month a no drinking, starting January 1st. Can this be done? Not sure...it's never been attempted by me before, but we are two days in and so far so good. But for some context on how I got to this state - for Christmas dinner this year on my family's side,my contribution was dessert. I made two different desserts. I was only going to make one, a White Chocolate Cranberry Cheesecake, but then my mom reminded me that my brother doesn't really like cheesecake ever since that 'bad cheesecake that he tried when he was a kid.' I already had my heart set on the cheesecake, so instead of changing course I decided to add a second dessert, a Mocha Chocolate Roll. I've linked to those recipes here and here in case you are interested. 2) Canning! 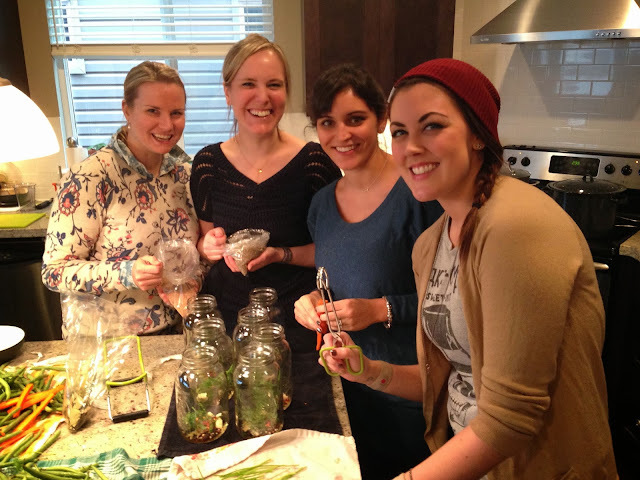 On an afternoon in early December, I had three girlfriends over and we all decided to try canning for the first time. We chose pickled beans, the kind that are perfect for Caesars - yum. We bought pounds and pounds and beans, and had a really fun day learning how to can. Ashley and Kendra washing approximately 2.5 million beans, give or take, with a smile on their faces. Kristy determining our carrots:jars ratio. Kendra breaking the rules and sneaking too many carrots into the jars. Then we made even neater piles, because the OCD kicked in. Our pretty jars, right before our pickling mixture was added. ...only, the thing is, that we missed the final water bath step, or really any sort of processing step at all, so there was an extremely high chance of botulism in those jars that you see there. Apparently botulism is bad and causes things like getting really sick and even death, so all of those beans that you see there had to be eaten by the garburator instead of by me and my friends and family. Also we really have no idea how we missed this step since we were going from about three different recipes, and upon closer inspection a week or so later each of those recipes clearly included that step, but things happen (or don't happen, as it were). It was still a really fun day and, hey, at least I now own canning jars. I'm excited to try canning again in the spring when I attempt pickled asparagus, also perfect for Caesars. :) Too bad this experience was more of a "can'ting" episode than "canning." Wah wah. 3) The Gluten-Free Thing! Back in July 2012 I cut out gluten, and kept it out of my diet up until December 2013 when it showed up once, twice, fifty-five times. The jury is still out on whether a gluten-free diet does help with my migraines and stomach problems. I mean, I know that it does, but not all the time, which is frustrating. Sometimes it's worth a migraine to eat that slice or four of pizza, and I then have to deal with the consequences. Sometimes it's not worth it. I definitely do see value in cutting out wheat, but just a heads-up that you may start to see some more wheat-filled recipes on the blog this year if I decide that I want to, and that's why. 4) Meatball Day! 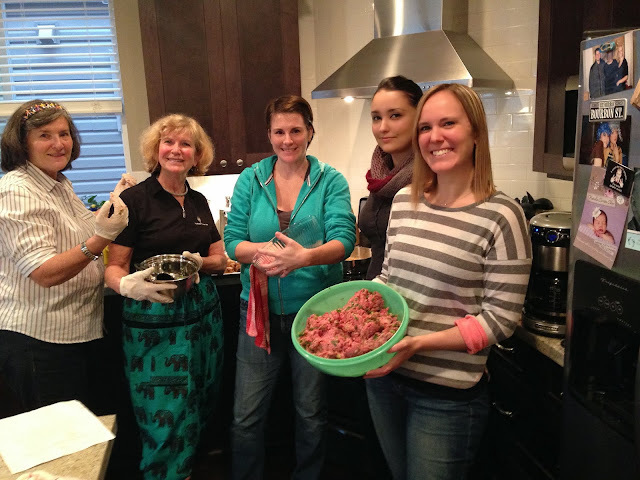 I had a meatball making day (yes, a meatball day) with my mom, BFF, BFF's mom (who doubles as my mom's BFF), and my brother's girlfriend. Sheena (my BFF), Alex (my brother's girlfriend), and moi! We made all sorts of balls...my granny's (sooooo good) sweet and sour meatballs, spaghetti-style meatballs, jalapeño cheddar appetizer meatballs, turkey curry meatballs, and whiskey pepper appetizer meatballs (recipe courtesy of my BFF's stepmom Denise), divvied them up between us, and froze them for later consumption. I'm not lying, we made about 1300 meatballs, and there were only like two jokes about balls the entire day. Not even half of how many meatballs we made. Not even half. 1300 is way higher of a number and two is way lower of a number than what I had forecasted for the results to look like, so way to go us! 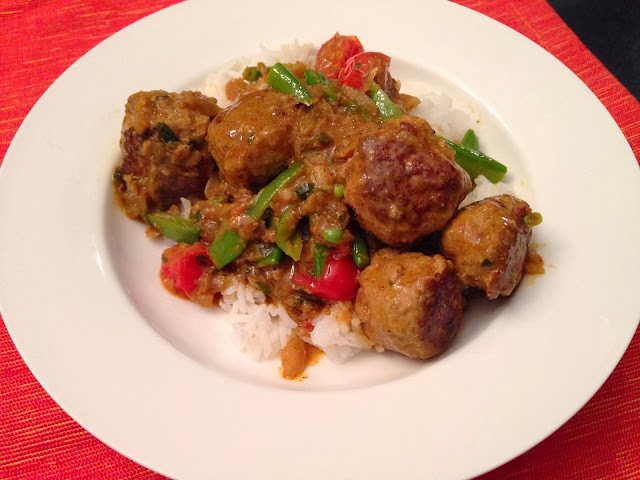 I've already posted the recipe for my granny's awesome sweet and sour meatballs in the past, and I will eventually post the recipes for all of the other meatballs that we made as we slowly defrost them from the freezer and consume them, but today I'm posting about these Turkey Meatballs in Curry Sauce, which are a dinner entree type of ball. You will like. Technically my mom was the sous chef and my brother's girlfriend Alex was in charge of cooking the Turkey Meatball in Coconut Curry Sauce recipe on Meatball Day, but hey, I reheated it the next night, so I'm stealing at least some of the credit! is what I was working on. Have no fear that your turkey may turn out dry...these meatballs stay super moist even when reheated, and the taste is almost like beef. The Best of Bridge, where this recipe hails from, also deserves a high five! Have I mentioned how much I love these cookbooks? Of course I have. The Hubby even got me the new Best of Bridge Slow Cooker Recipes book for Christmas...squeal! Crack your egg into a large bowl, and lightly beat. Add the bread crumbs, 1 tablespoon of the chopped cilantro, all of the ginger, 1/4 teaspoon of salt, and 1 tablespoon of the curry paste. Mix until well combined, and then let sit for about 5 minutes. Add the ground turkey, and mix thoroughly with your hands. Form the mixture into 20 meatballs. Heat the oil over medium-high heat in a large non-stick skillet. Cook meatballs, turning frequently, for 5 to 7 minutes, or until browned all over but still slightly pink inside (you will finish cooking the meatballs once they are added to the sauce). You may need to work in batches of 10 balls at a time, rather than trying to cook all 20 meatballs at once. Transfer the meatballs to a plate. Reduce heat to medium, add the onion to the pan, and cook for 5 minutes or until softened, adding a tablespoon of cold water once or twice if the onions begin to stick to the pan. Add the remaining 2 tablespoons of curry paste to the pan, along with 1 tablespoon of cold water; cook for 1 minute while stirring constantly. Whisk in the coconut milk, 1/2 cup of the chicken broth, and the sugar, and continue whisking until the curry paste has dissolved. Return the meatballs back into the pan with the curry coconut sauce, and bring everything to a boil. Reduce the heat to a simmer, and, turning meatballs occasionally, cook for 10 minutes or until the middle of the meatballs is no longer pink and the sauce is starting to thicken. If you prefer a thinner sauce, add 1/4 to 1/2 cup more chicken broth. Taste your sauce to determine whether more salt is required. Add the peas, the tomatoes, and the rest of the cilantro, then simmer for another 2 minutes. Serve over top of cooked white rice. Garnish with toasted almonds, if desired. Enjoy! Hi. I am over from goodreads. 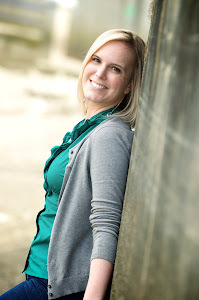 I followed you and I have to say I love your blog!!! Especially the different pics showing the different prep work that went into making them.